Ship-to-ship combat in the RPG sequel's archipelago. At the end of Pillars of Eternity, after slaying Thaos and restoring the natural cycle of life and death to the Dyrwood, the Watcher settles down in their stronghold of Caed Nua. But any hopes of a peaceful life are dashed when, in the cavernous dungeons beneath the fortress, the god Eothas awakens. The deity, taking the form of a giant stone titan, breaks free. Caed Nua is destroyed and the Watcher is badly injured. But they survive and so begins a quest for vengeance as our hero travels to the exotic Deadfire Archipelago in pursuit of the rampaging god that destroyed their home and left them for dead. Deadfire is a direct sequel to Pillars of Eternity, the crowd-funded RPG that took the best bits of classic Infinity Engine games like Baldur’s Gate and Planescape: Torment—deep systems, rich worlds, reactive stories—and confidently retooled them for a modern audience. You are, once again, the Watcher: an individual blessed (or cursed, depending on who you ask) with the ability to look into people’s souls and relive the past lives of their ancestors. The character you created in the first game can be imported, or you can make a new one. The ragtag islands of the Deadfire Archipelago are scattered across a great expanse of ocean spanning thousands of miles. Some of these islands have been inhabited for generations by indigenous tribes, or have recently been colonised by foreign explorers. But many remain uncharted, home to rare treasures, forgotten dungeons, and fell beasts. Developer Obsidian (Knights of the Old Republic II, Fallout: New Vegas) is promising a variety of terrain, including lush jungles and barren deserts: a far cry from the temperate forests of the Dyrwood, which was a fairly typical fantasy setting in most respects. Watch as Andy takes you through a ship encounter in Pillars of Eternity 2: Deadfire. The lawless Deadfire Archipelago is like a watery Wild West, and someone is always looking to scrap. Pirates roam the seas, looking for passing ships to plunder or just blow out of the water for sport. And this is the thing that really sets Deadfire apart from its predecessor. As well as the traditional RPG stuff you’d expect from a Pillars game, you’ll also be spending a lot of time at sea, exploring, travelling, and trying not to end up as a pile of smouldering driftwood. Freedom of expression is a big part of the Infinity Engine lineage of RPGs, and Deadfire is no different. The Watcher doesn’t have to be a hero, and there are plenty of ways to cause trouble in the archipelago. As well as pirates you’ll see defenceless merchant ships on the world map, and you can attack and loot them if your black heart desires it. But repeatedly sinking civilian ships will give you a bad reputation, and people you meet can react to it. Ship combat, which is turn-based, takes place on a separate screen with its own dedicated interface. There’s a circle showing you which way your ship is facing relative to the enemy, and you command your crew by selecting items on a menu. You can use a turn to reposition your ship, speed up to get closer to your opponent, slow down to create some distance, or fire your weapons. Your cannons are only effective at specific ranges, however, which makes positioning important. If you’re trading paint with the enemy, your long range guns will be useless. An illustration showing the enemy ship, its distance, and its current level of damage is an at-a-glance way to see how the battle is going. This is an elegant way of representing naval combat, rather than trying to make it occur in real-time, which Pillars’ engine just wasn’t designed for. Wind was originally going to be a factor, but Obsidian decided it simply wasn’t fun having to manage that on top of everything else. The studio is still refining the system and it may change again before release, but what’s in place now is a fine way of getting across the idea of fighting at sea. If this all sounds a bit ship-heavy, don’t worry: there’s plenty of traditional RPG stuff in Pillars II, including wizards, dungeons, and dragons—whose skulls you can decorate your quarters with. While investigating an uncharted island I stumbled into a sand-blasted ruin guarded by an immense titan quivering with magical energy. So while it is indeed very big on pirates and sailing, it’s still fundamentally a fantasy game. And it won’t all be small, isolated islands either: Neketaka is a huge city and cultural hub where you’ll probably spend hours completing quests and talking to the locals. Obsidian could have just made Pillars again with a new story and setting, and a lot of people would’ve been happy. 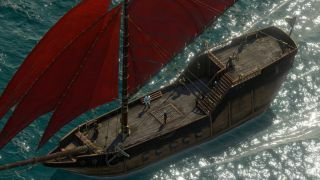 But it’s exciting to know that Deadfire is so much more, bringing a thrilling seafaring element to the familiar fantasy role-playing. Naval combat, crew management, ship upgrades, and piracy are just a few of the tantalising new additions to the Pillars formula, and it’ll be fascinating to delve into the strange culture, rituals, and history of this vivid new setting. You can read more about Deadfire, and get a code for an exclusive in-game pet, in the next issue of PC Gamer, which hits UK shelves on Feb 8.